The digester uses direct injection of steam at 6 bar to dissolve sodium silicate rock in water to produce approx. 2.5 tonnes of solution. The finished product is blown out of the vessel (under it's own head of steam, or with compressed air, if the vessel has cooled) to a storage tank via a plate heat exchanger. The heat exchanger reclaims the heat from the product and heats the water for the next batch, as well as ensuring the product is cool (to minimise evaporation loss, and reduce the chance of injury due to scalding). sampling station enabling sample to be taken while digestion is in process. PLC control of steam injection time and safety interlocks. 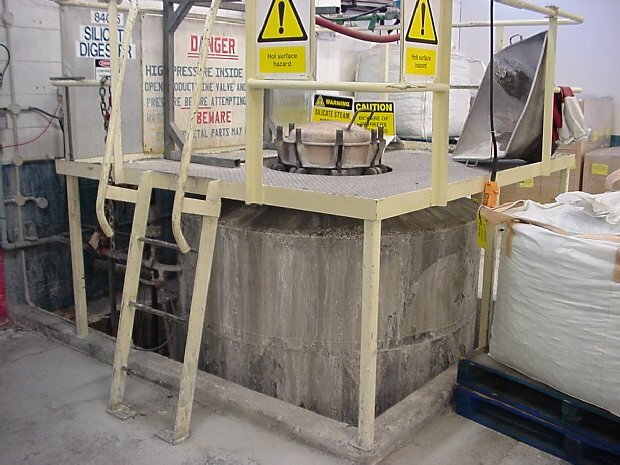 overhead hoist for dispensing the rock (from 1 tonne bulk bags).